Explosives detection dog teams can be used in a variety of operational scenarios to indicate the presence of explosives. This is achieved using an appropriately trained canine and handler team indicating the presence of an odour which the dog has been trained to find in the operational environment in which they have been trained to work. 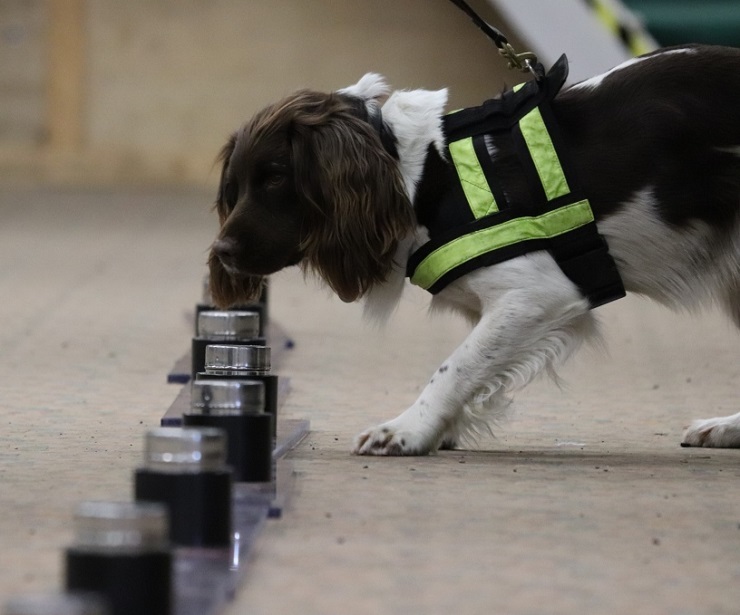 Explosives detection dog teams can provide a versatile, mobile and real-time search and detection capability that can offer significant benefits to many operations. They are most commonly applied to aid the search of one or more of buildings, areas, vehicles or bulk deliveries, but also have the potential to be an efficient and effective tool for screening people at Crowded Places and other high footfall locations. Detection dogs may also be trained to detect firearms, as well as a wide variety of other contraband, such as narcotics. Combining capabilities – for example training a dog to detect explosives and firearms or explosives and narcotics – should normally be avoided unless a common operational response is acceptable. Detection dog capability arises from a handler and dog working effectively as a team; a handler may operate one or two dogs, but a dog should not be shared between handlers. In order to provide an effective capability, dogs need to be trained to detect the materials of interest, trained in the relevant search discipline, and trained in situations and environments that replicate the specific operational scenario. Training should be conducted regularly in order to maintain capability, with additional training undertaken as necessary when any performance issues are identified or when new capability needs to be introduced. Detailed training records should be kept. Dogs are intelligent animals, and this underpins their ability to search. However this makes them able to learn unintentional cues from handlers during training which can undermine their performance in the operational environment. The ability and behaviour of the handler cannot be underestimated in enabling the performance of the dog. A good handler, both during training and in the field, is essential to achieving and maintaining good detection performance. The welfare of the dogs needs to be considered at all times. Organisations must ensure that any dogs are worked within their capacity and rested and exercised regularly and in suitable environments. Unfortunately there is no definitive answer as to how long a dog can work effectively without a break – every dog is different and different search tasks will place different physical and mental demands on the dog (and handler). A competent handler should know their dog and be able to spot signs that a break is needed. A detection dog will typically “indicate” by freezing and looking at what it perceives to be the location of the source of a trained odour. It is important to understand that any such indication by an explosives detection dog does not mean that an explosive threat (material or device) is definitely present; the dog may have smelt something benign but similar to a trained odour, or residual odour from the previous presence of explosives (e.g. when screening a vehicle that has previously transported explosives explosives legitimately). A dog may also show “interest” in a particular area or item without indicating; this may, for example, occur when the dog encounters an odour similar, but not identical, to a trained one. As signs of interest may be quite subtle, it is important that the handler understands their dog sufficiently to reliably spot them. The handler therefore plays a key role in continually observing and assessing the situation as search activity proceeds, and in determining and initiating an appropriate response when the dog indicates or shows interest..
Whilst canine detection offers many advantages, like all technologies and techniques it is not perfect; it should not be used in isolation and the skill and experience of the operator (the handler in the case of detection dogs) is key to achieving an effective capability. Canines can offer a particularly useful detection capability to screen complex vehicles, abnormal loads, bulk deliveries, or large areas that cannot easily be screened by other methods. Many different government bodies in the UK use detection dogs. These dogs are subject to standardised training, accreditation and annual licensing, which serves to demonstrate that they are maintained at the required standard for operational deployment. Many private companies also offer the services of detection dogs. There is, however, currently no Government-recognised scheme for accrediting private sector detection dog teams (an exception being for specialist, regulated aviation security measures). These teams may not, therefore, have access to the results of the latest research regarding best practice, and they may not have easy access to the full range of threat-relevant training materials. It is essential that any organisation looking to utilise private sector detection dog services understands the capability offered by their chosen provider and is clear that this addresses their operational requirement. Key points to consider when specifying, procuring and implementing detection dog services are outlined in the guidance note below. CPNI is working with partners including the Home Office, Department for Transport and Defence Science and Technology Laboratory to develop a suite of evidence-based guidance notes (see related page below) detailing good practices underpinning delivery of effective detection dog capability. These are primarily intended for detection dog handlers and trainers, but should also prove useful to security managers looking to commission effective detection dog capability.